Each year increasing numbers of couples from abroad come to Tuscany to be married. Why travel from afar for a ceremony that is traditionally a family and friend celebration? Some choose Italy because they have relatives here. For some couples the decision to have a wedding far from home is pragmatic as the event will be more intimate. Overall, many choose a destination wedding because it is exciting, even glamorous, to combine their nuptials and a vacation in an unforgettable setting. Some couples opt for a more “do-it-yourself” event, which requires more time and patience but is less pricey. One option is a single venue for ceremony, reception and accommodation, with all services on-site. The bureaucracy of being married in Italy can be daunting, especially for non Italian-speaking foreigners. Patience and persistence, along with early planning, are necessary. Italian law is very specific and every document has to be translated by a legal professional. A general rule is The British Consulate has noted that the number of UK citizens applying for Italian marriages has increased significantly and most of the complications in arranging marriages were because people did not have their documents in order. It is this bureaucracy that leads many people to work with a wedding planner. One such business is La Voglia Di, which can facilitate anything needed for a beautiful ceremony and celebration from the paperwork to accommodation and catering, music, flowers, photographer and hairdresser. For more info, visit www.lavogliadi.com. The type of ceremony, civil, religious or symbolic is another consideration. Civil ceremonies are usually held in a city hall chamber and officiated by a mayor or his delegate. 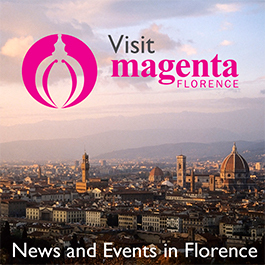 Recently the city of Florence has authorized the Rose Garden near Piazza Michelangelo and the Sala della Carità in the Bardini Museum, as well as the sumptuous Salone dei Cinquecento in Palazzo Vecchio, as settings for civil ceremonies. Depending on venue and time of day or week, the fee for ceremonies ranges between 750 and 5,000 euro. Religious church ceremonies, which cost a minimum of 1000 euro, vary according to denomination, diocese and local policies. In Florence, St. James American Church hosts about 20 weddings each year, but Italian law requires a civil marriage first, either in the home country or in Italy. Other local non-Catholic churches that can host weddings are St. Mark’s English Church and the German Lutheran Church. It is this bureaucracy that leads many couples to work with a wedding planner, who can facilitate everything needed for a beautiful ceremony and celebration from the accommodation to catering, music, flowers, photographer and hairdresser.